This is a perspective of the seafloor showing preliminary results of gas seeps detected by multibeam sonar in vicinity of Biloxi Dome in Northern Gulf of Mexico. Gas seep locations are shown as blue dots and are overlaid on the seafloor bathymetry that was collected Credit: Image produced by the University of New Hampshire Center for Coastal and Ocean Mapping/Joint Hydrographic Center using IVS Fledermaus software. A technology commonly used to map the bottom of the deep ocean can also detect gas seeps in the water column with remarkably high fidelity, according to scientists from the University of New Hampshire and the National Oceanic and Atmospheric Administration (NOAA). This finding, made onboard the NOAA ship Okeanos Explorer in the Gulf of Mexico, will lead to more effective mapping of these gas seeps and, ultimately, enhanced understanding of our ocean environments. 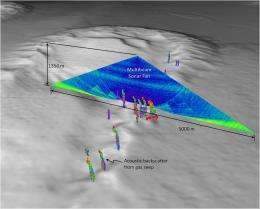 The mapping technology, multibeam sonar, is an echo-sounding technology that surveys a wide, fan-shaped swath of the seafloor, providing much greater coverage than the single-beam sonar systems previously used to map seeps. "We wanted to see whether we could map a large area of gaseous seeps effectively using this technology, and how well the multibeam sonar compared to our very sensitive single-beam sonars," says Tom Weber of UNH's Center for Coastal Mapping, who was lead scientist of this mission. "It turns out it works wonderfully." The multibeam sonar on the Okeanos Explorer produced data to make high-resolution maps of gas in the water column in depths ranging from 3,000 to 7,000 feet. Working jointly with scientists and technicians from NOAA's Office of Ocean Exploration and Research (OER) and the Bureau of Ocean Energy Management (BOEM), Weber and colleagues mapped more than 17,000 square kilometers of the Gulf of Mexico from Aug. 22 through Sept. 10, 2011. This is a view of the multibeam sonar water column backscatter data used to detect gas seeps. Gas seeps derived from the sonar are shown in the foreground. Credit: Image produced by the University of New Hampshire Center for Coastal and Ocean Mapping/Joint Hydrographic Center using IVS Fledermaus software. Sonar finds features on the ocean floor much the way a bat tracks its dinner: "It's an acoustic wave hitting the target and reflecting back," says Weber. Multibeam sonar sends those sound waves in many directions at the same time, enabling it to "see" a swath of targets that is much wider than what would be observed with a single-beam sonar. While it's known to be an effective tool for mapping large, stable items like the bottom of the ocean, it wasn't designed to detect targets within the water column. Gas seeps  primarily but not exclusively methane  are numerous in the Gulf of Mexico, emanating from natural fissures in the seafloor. They can be associated with oil, but oil was not the focus for Weber and his collaborators. Finding and mapping gaseous seeps, says Weber, helps scientists better understand the ocean: its methane fluxes, carbon cycle, and deep-water marine environments. Further, the Gulf of Mexico is home to many active oil-drilling sites, and mapping the gaseous seeps in the water column will inform scientific as well as regulatory decisions. "In the deep ocean, there are life forms like tubeworms and clams associated with gas seeps, and they're treated as protected resources," Weber says. Further, mapping these seeps will give researchers baseline data on what exists in the water column, helping them determine whether future seeps are natural or unwanted byproducts of drilling. "Mapping the seafloor and the water column are essential first steps in exploring our largely unknown ocean," says Weber. "This expedition confirms earlier indications that multibeam technology provides a valuable new tool in the inventory to detect plumes of gas in the water column, and especially in deep water." Also on the mission from UNH were CCOM research scientist Jonathan Beaudoin and graduate students Kevin Jerram (pursuing an M.S. in ocean engineering) and Maddie Schroth-Miller (pursuing an M.S. in applied mathematics). NOAA's expedition coordinator and lead NOAA scientist on the mission was Mashkoor Malik, who graduated from UNH in 2005 with a M.S. in ocean mapping.